Add fresh flavors and fun combinations to your next party with these easy recipes for snacks and bites that you can easily pick up and eat with your fingers. Fully and truly. There is not a single thing on this list that requires a fork or a spoon—a few items benefit from a toothpick, but more for neatness than necessity. 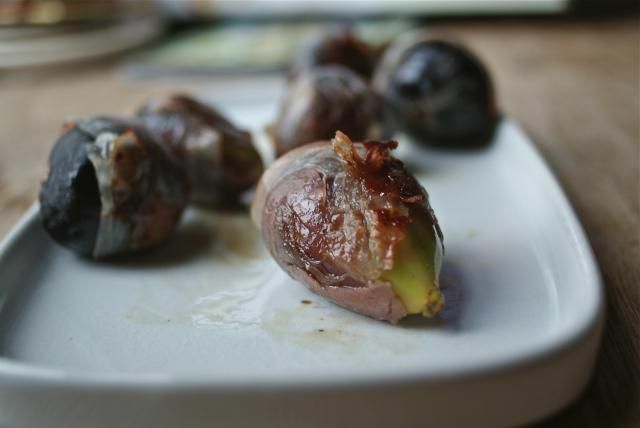 This recipe for bacon-wrapped figs is more or less in the name—figs wrapped in bacon and baked. Sweet and salty and totally delicious. Oh, and if you like, you can stuff them with cheese or almond (or both!) before wrapping them for even more flavor! A topping of garlic, breadcrumbs, and parsley, and a quick turn in the oven, transform clams into fun party food that come in their own organic and compostable serving vessel—just eat them right out of the shell. Thinly sliced beets, hot oil, and just a sprinkle of salt make a fun party food guests can't resist. See how easy it is to make beet chips. Looking for something even sweeter? Try sweet potato chips. Looking for something baked? See these zucchini chips. Looking for something more traditional? Try homemade potato chips. Padron peppers are a specialty of the Galicia region of Spain. They have a delicate heat (their flavor is more grassy than spicy). Simply cook them in a hot pan and sprinkle with salt—the recipe is just that easy. Another option is shishito peppers, a similar treat from Japan. Sun-dried tomatoes and crumbled bacon give this dip an insane amount of flavor—intense flavor perfectly balanced by serving it with fresh, crisp lettuce leaves for scooping up the dip. These green beans are very lightly coated by a quick soak in buttermilk and then a shake in some seasoned flour for a crispy coating that's almost like a tempura batter before being quickly fried. Serve with cherry tomatoes on the same plate or platter for color and brightness. Sit back as guests pop one after another in their mouths. Onigiri are a traditional dish in Japan, where they are often part of packed lunch. These hand-formed rice balls also make a fabulously substantial hors d'œuvres. Make them as small and bite-sized as you like. Offer a dipping sauce of one part chili oil and two parts soy sauce or tamari alongside if your crowd likes spicy. Freshly fried okra is a real treat, and it's easy to make in big batches to pass at a party. This version fries the okra pods whole, making them easier to handle, and coats them with cornmeal for extra crunch. Don't feel like frying? Try grilled okra instead! These fried eggplant sticks are inspired by the ones served at Galatoire's in New Orleans. The Tabasco and powdered sugar for dipping may sound odd, but you need to try it—the combination with the earthy eggplant tastes delicious. Sound good but you don't feel like frying? Try this baked version instead. One of the best flavor-to-effort ratios is simply chopped figs seasoned with salt and pepper and a bit of olive oil on toast. Add a smear of cream cheese, fresh chevre, or other spreadable cheese, if you like. These super easy and light corn patties are full of fresh corn so they pop with sweetness. If you feel the need to jazz them up, add a spot of pesto or salsa fresca. No fresh corn around? Try cauliflower fritters or zucchini fritters instead. The deep savory earthiness of mushrooms is intensified when you coat them lightly and fry them up. Sprinkle them liberally with fleur de sel or other high-quality flaky sea salt and serve them hot. Spring rolls, summer rolls, salad rolls... whatever you call them, these delightful rolls are full of fresh vegetables and tons of flavor! These ​Italian-style fried zucchini blossoms are best while they're still hot, but if the party's small and you're willing, your guests will love them. Fry them plain, or stuff them with a small bit of mild, soft cheese first for a more decadent snack. A quick turn on a hot grill and a bit of easy-to-make lemon butter make prawns or shrimp the perfect party food—easy to pass and easy to eat. Store-bought kale chips are often covered with all kinds of processed and fake flavorings—no such worries when you bake them yourself. And that's all it takes, too, baking. These kale chips couldn't be easier and you can make them the morning of the party. A plate of these lamb meatballs and a salad makes a delicious dinner, but they are so fully spiced that you can also just poke a toothpick in each one and pass them at a party. Sure, they're a bit of work, but freshly shucked oysters turn any gathering into a party. Serve them with wedges of lemon, Tabasco, or maybe a bit of cocktail sauce. Or, mix things up and serve grilled oysters instead. 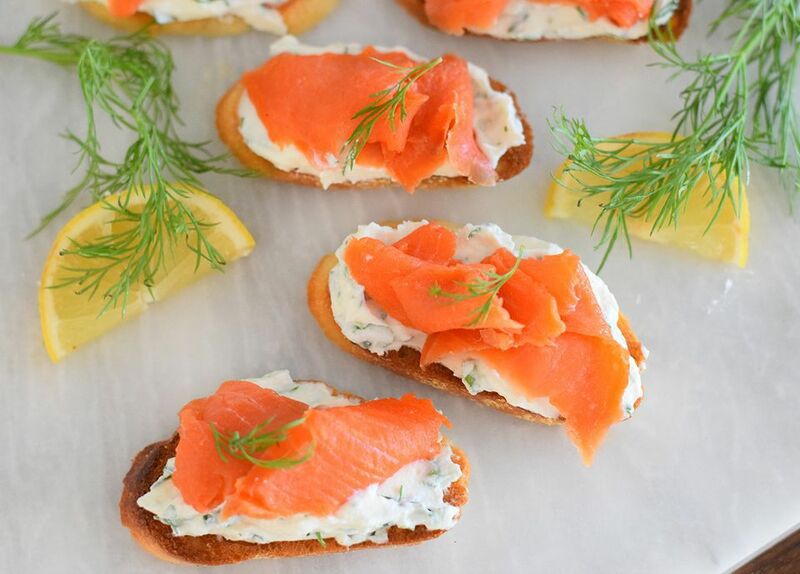 Herbed ricotta cheese is a fluffy switch from classic cream cheese in these beautiful brunch crostini. You may think of roasted cauliflower as more of a side dish, but this version gets such a hefty dusting of spices (mixed in with a liberal coating of butter) before being roasted, they can stand their own as an hors d'œuvres. While stuffed grape leaves take a bit of time and effort to make, they can be prepared a full day ahead to great effect. Make sure to taste the filling to make sure it's as seasoned as you like it! Give your party a retro, but delicious, vibe by offering up classic Swedish meatballs—a simple toothpick works from transporting from serving vessel to mouth. A little salt, a little spice, and you can turn sweet potatoes into a tasty dip perfect for chips or other vegetables. Think of it as a super flavorful, super colorful hummus. Sweet, sticky, and made in the slow-cooker, these Teriyaki chicken wings are a crowd favorite that requires minimal effort by the host (be sure to offer them with plenty of napkins, though, that sauce can get messy!). Offer these lettuce wraps pre-filled (as pictured) or serve the filling on the side for guests to add themselves. A wonderfully savory cheese mixture gets folded up into phyllo dough and baked until the cheese is melty and the dough is crunchy golden in this Greek favorite. Serious alchemy takes place here as shredded summer squash and butter get turned into a luscious dip. Serve ​this zucchini spread for people to use as a dip with crackers or veggies, or spread in on toasts and top with a sprinkle of Aleppo pepper or another lightly spicy element as a super-easy crostini treat.